Base of red onions, ginger garlic, and vine ripened tomatoes combined with chicken. Tandoori baked chicken breast cooked in a smooth nutty curry with a touch of saffron with onions, ginger, garlic, vine ripened tomatoes and spices. Do-piyaza means two onions. Chicken cubes cooked with onions, raw mangoes, ginger, garlic, and onions. Also known as Butter chicken. Shredded chicken cooked with red onions, garlic, ginger, tomatoes, cardamoms, cinnamon, mace flower, low fat cream, and butter. Chicken cooked in gravy of almonds, cashews, four kernels, pistachio, saffron and shredded coconut with spices and onions, ginger, garlic and vine ripened tomatoes. Chicken cooked in a base of fennel seeds, fenugreek seeds, mustard seeds, royal cumin, and onion seeds with onions, garlic, ginger, and tomatoes. Chicken cooked with fenugreek herb in gravy of garam masala and onions. Chicken cubes cooked with fresh spinach, red onions, ginger, garlic, and little Asafetida. 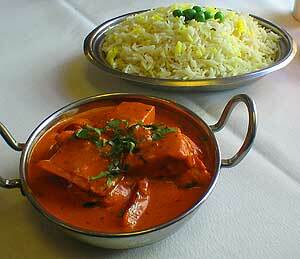 Chicken marinated in turmeric and gravy prepared with South Indian spices, ginger, and onions and mustard seeds. Chicken cooked in fresh coconut milk, mustard seeds, and red onions. Chicken cooked with slices of onions and bell peppers, in an iron wok. Kachri is a kind of dry baby melon powder and is only found in Rajasthan. 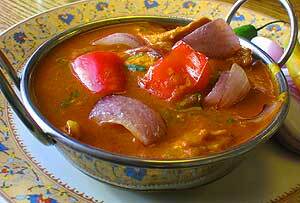 Here chicken is cooked with aromatic star anise and Kachri powder and adding ginger, garlic and tomatoes.